1: SAFETY: One of the key advantages of electronic shifting is dual shifter positions. You get shift buttons on both your aerobar tips and on your brake levers (or at least you should – see important note below). Hence you never need to remove a hand from the base bar and reach out to your aerobar tip to execute a shift. This is extremely valuable when in a pack situation (see #2) or otherwise technical section. Keep a firm grasp on the horns and shift like crazy (and brake too) if needed. IMPORTANT NOTE: Some high end tri bikes have done away with the brake lever shifters in favor of hydraulic brakes (which require special brake levers and hence replace the electronic shifter brake levers); yes some have jury-rigged shifter buttons onto these levers, but do you really want to go there? 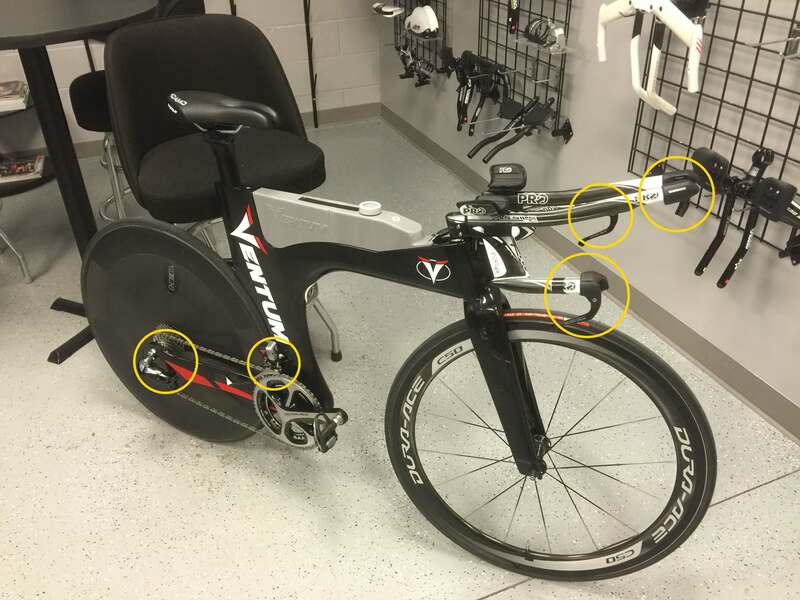 NO ONE needs hydraulic brakes on a tri bike – NO ONE. EVERYONE needs brake lever shifters on a tri bike. End of story. I’m talking to you, Cervelo (and I believe Specialized has some previous Shiv versions with hydraulic brakes)! PLEASE do not buy a Di2-equipped bike without brake lever shifters! Some bikes come without just to keep the price down, so plan on adding them if buying one of these bikes (e.g., Felt B2). The brake lever shifters will run you $350 retail for Ultegra. Don’t even bother getting Di2 if you don’t have brake lever shifters. 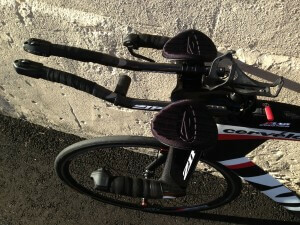 On this P5 we used the “3” version and TriRig brakes. 2: PACK RIDING: The brake lever shifters effectively turn your tri bike into a road bike when pack riding (you don’t ride in your aerobars in a pack, DO YOU?). Most triathletes do some amount of pack riding with roadies or other triathletes (or at least they should). Electronic shifters remove the tri bike wobble or late braking caused by the one-handed aerobar shifter reach. Tri Geeks previously shunned by the local roadie peleton may be able to regain favor (assuming they stay out of the aerobars, don’t attack every time they get to the front, and don’t overlap wheels). 3: SPEED and EFFICIENCY: Electronic shifting can (should) make you faster. The more hilly and technical a course, the bigger the advantage. After several rides, it starts to seem that your derailleurs are wired directly into your brain (maybe Shimano’s next innovation…). You never think about shifting anymore. Your thumbs, wherever they may reside at a given moment, just shift automatically. No longer will you debate on that long steep climb whether you want to reach out onto the end of your aerobar and slam it down to the small ring. It will just HAPPEN. You will shift far more often, and more efficiently. You will actually use both chainrings because it is so easy. You will never get bogged down coming out of a corner because you’re in a big gear and can’t reach out to shift while trying to accelerate. You will never again need to feel like your legs are about to spin off when preemptively dropping it down to the small ring coming into a hill or turn. With electronic you really can wait until the last second, and you can and will double shift – drop to the small ring while simultaneously shifting up two cogs in back. The transition is barely noticeable to your legs now, but you are in the small ring and ready to tick it into easier gears as the climb steepens. You will simply ride better. Not to mention, those run legs should feel a bit better too. 4: RELIABILTY: The stuff just works. Shimano Di2 anyway – don’t know about any of the others yet. I have yet to see a single failure. I have heard of a case of older Dura-Ace 7970 croaking completely, but did not see it with my own eyes/hands. The shifting stays perfectly adjusted. It shifts perfectly every time. Front shifts are effortless. The chain doesn’t drop. This all assumes it is installed and set up properly, which is really exceedingly easy to do. Easier than mechanical shifting. Yes you need to charge the battery occasionally. And I do mean OCCASIONALLY. Once every month or two should do it. Just hold down any shift button and it tells you how much charge is left. “But what about all that electrical stuff? Won’t it short out or something and leave me stranded?” Not that I have seen. But I have seen PLENTY of mechanical shifting failures. Ask Macca about Kona a few years back. Or what about the guy I know whose SRAM mechanical shifter failed during an Ironman forcing him to hold the shifter back for most of the bike or else be relegated to the highest gear. Missed a Kona slot by 90 secs or so. I am sure the shifter was worth way more time than that. Anything can fail, but electrical seems more reliable in my experience. We will see what happens when some of it starts to approach several years of service. But by that time with mechanical, you will need several cable replacements and readjustments at the very least. 5: SIMPLICITY: It really is simple stuff. Just a couple of junction boxes, wires, and a rechargeable battery. The wires easily plug and unplug using the included tool and form water-tight connections. No more cables and housing that fray and corrode and muck up your shifting. No more cable stretching (also mucks up your shifting) when new cables are installed. No more multi-hour sessions redoing your housing and cables in your internally routed superbike and readjusting the derailleurs. Need to adjust the rear derailleur because your race wheel cassette is just a bit different than your training wheel? Press a button. Press another button a few times. DONE. Yes it costs more. There is no need to pony up for Dura-Ace as Ultegra works just as well and is only incrementally heavier. But if you look at electronic shifting in the same light as other performance upgrades like a power meter or race wheels, this cost makes more sense. If you need further convincing, ask someone who has it and then was forced for some reason to go back to mechanical. Such as when your race bike is away with TriBike Transport. Or you are between new bikes and have to pull out the old beater (even if it is a P3). We can say from personal experience, nothing will make you appreciate your electronic shifting more. Or make you wonder how you ever lived without it.